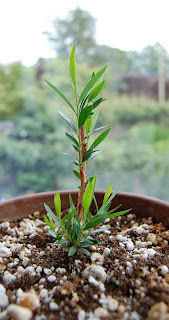 This is a bottlebrush seedling (Callistemon), given to me during my Australian citizenship ceremony. It's not clear which of the many species it is, so we'll have to see how it turns out. I thought it was done for following a week away for P&T's wedding - it was dried to a crisp, lost all its leaves, and was showing no signs of life. But my father revived it, and now it is back in business! I guess the legendary Australian drought resistance of native plants really is true.